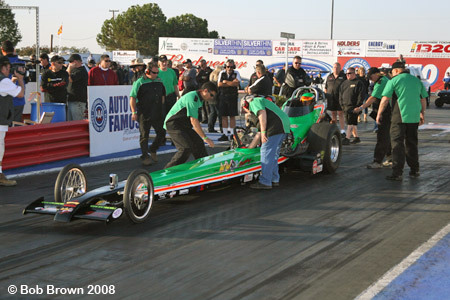 Bakersfield, CA - October 10 - 12, 2008: For Jim Murphy and the WW2 Racing team the 2008 season was a good one that ended on a disappointing note. 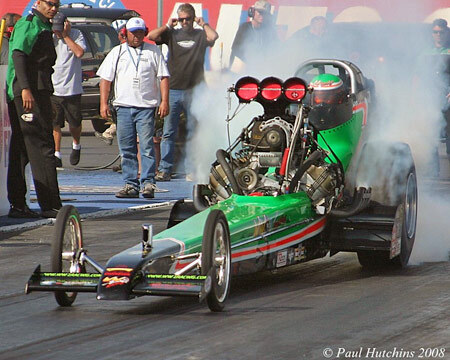 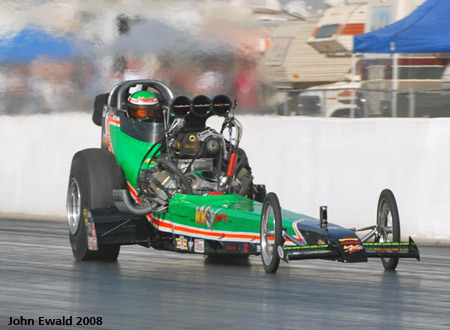 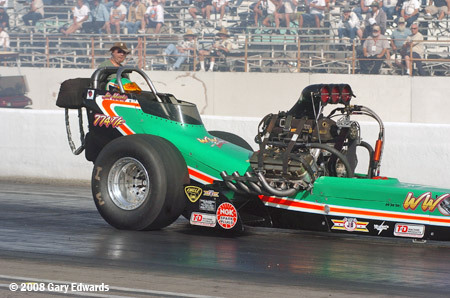 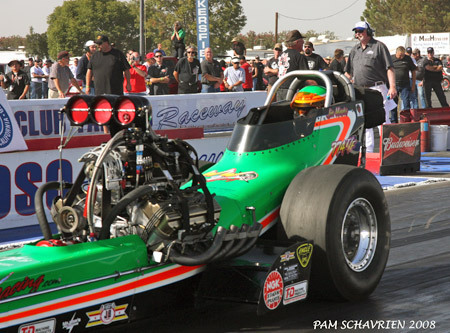 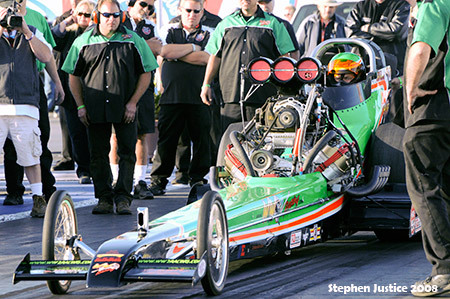 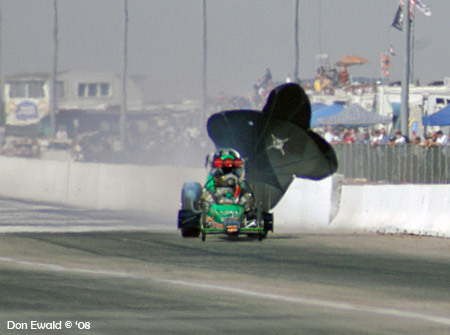 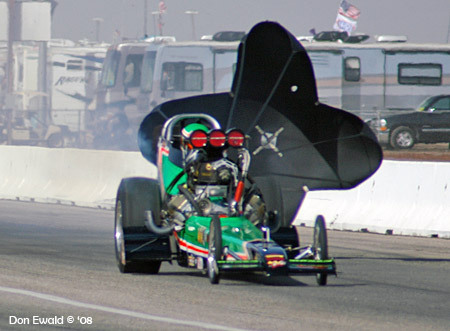 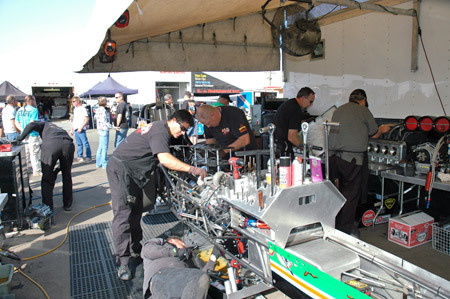 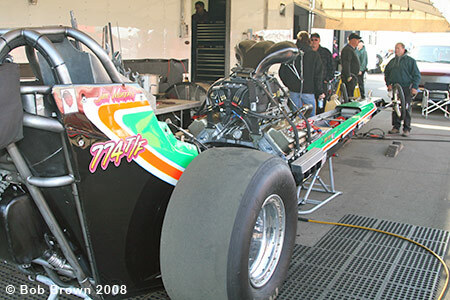 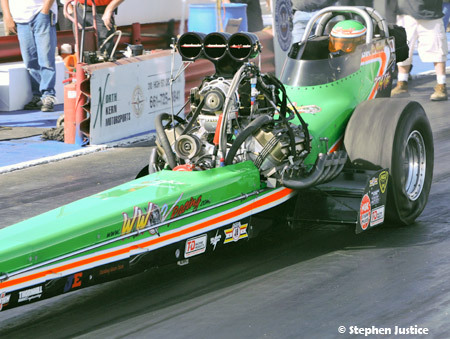 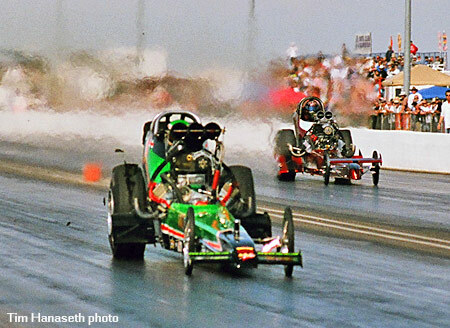 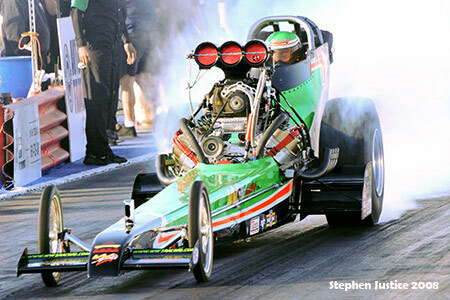 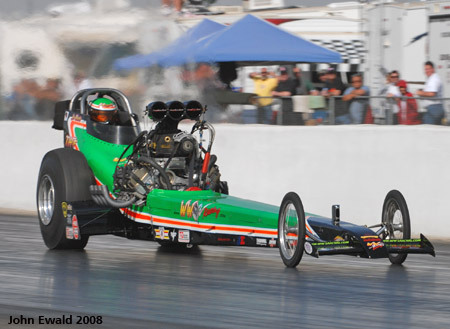 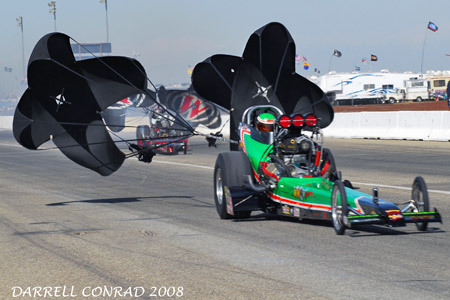 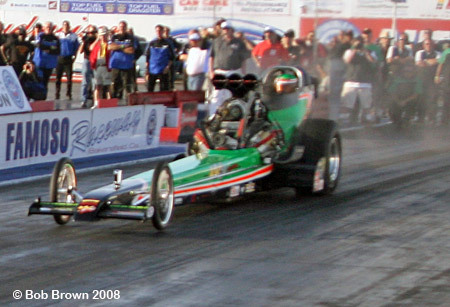 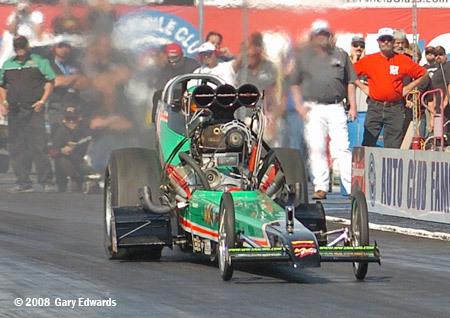 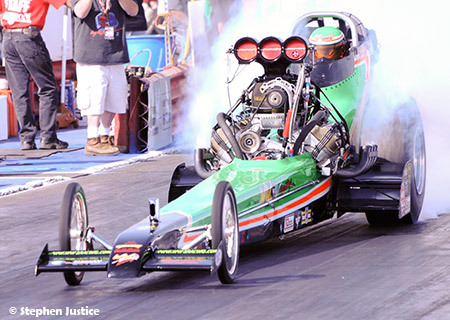 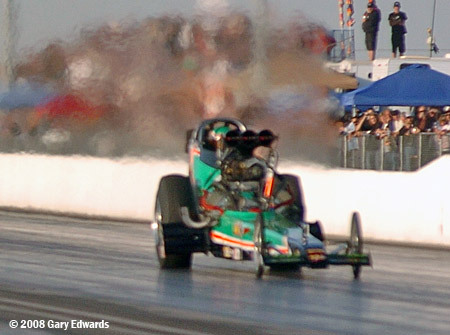 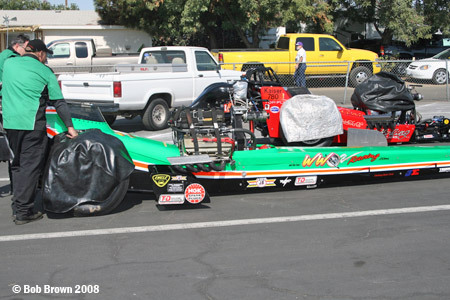 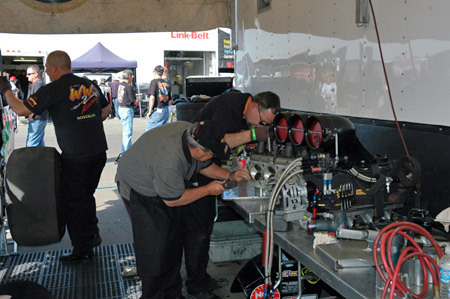 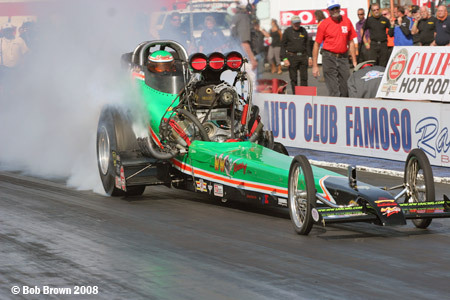 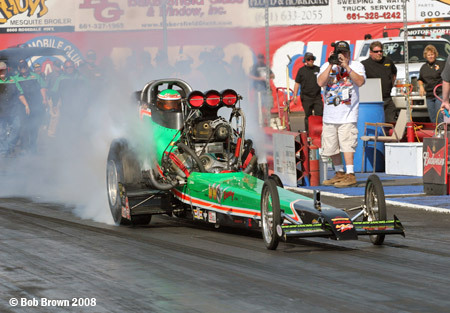 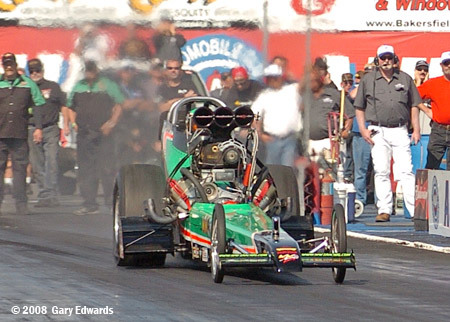 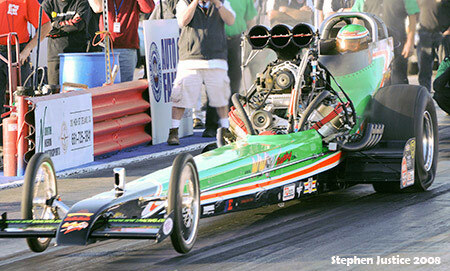 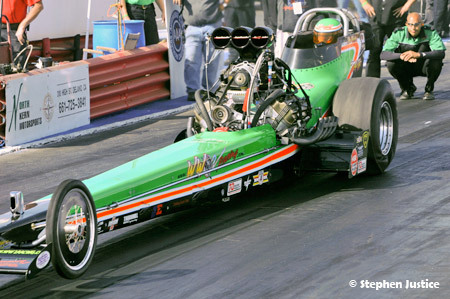 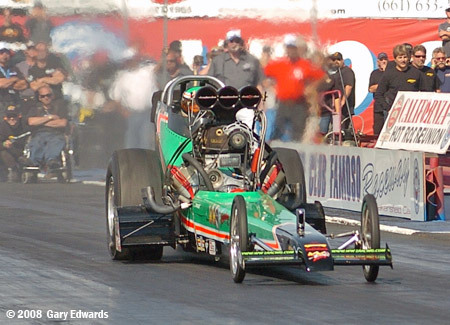 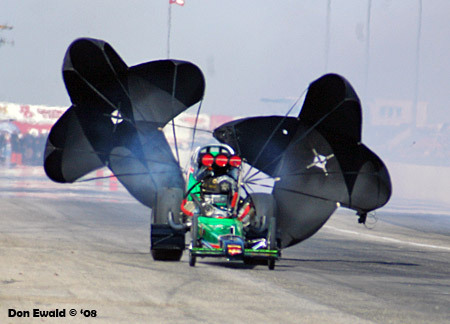 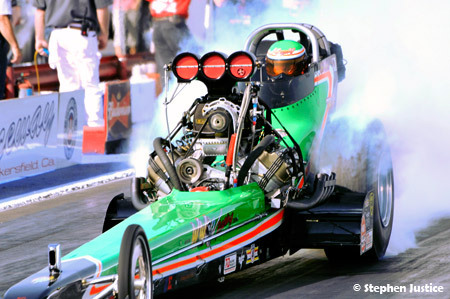 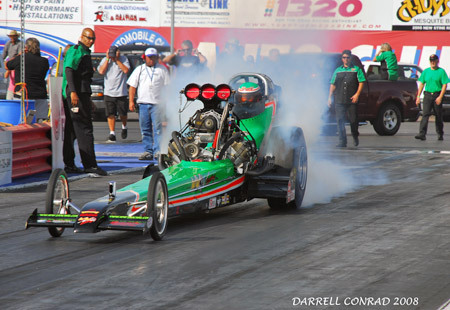 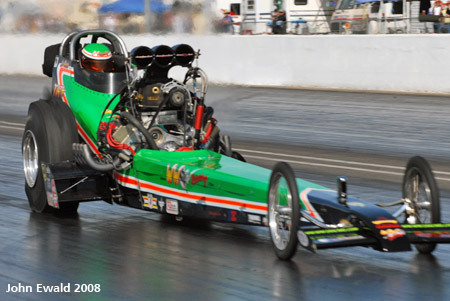 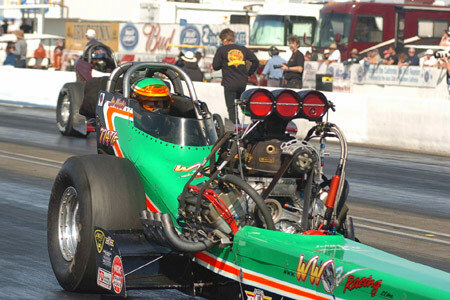 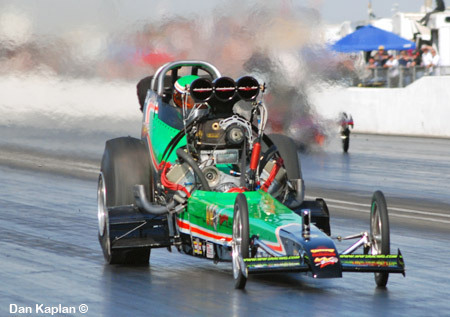 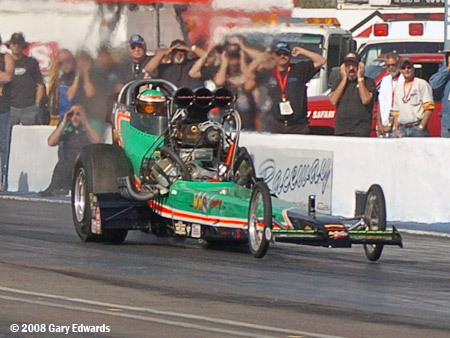 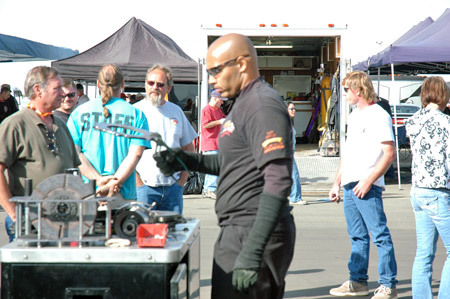 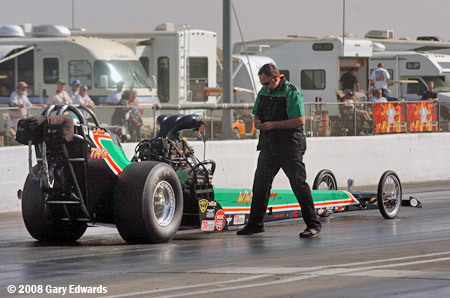 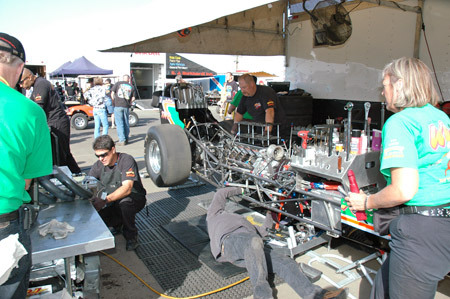 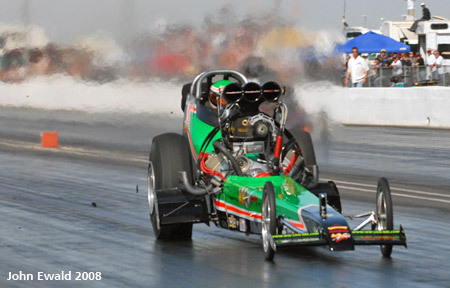 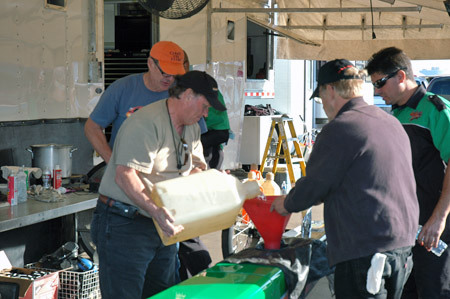 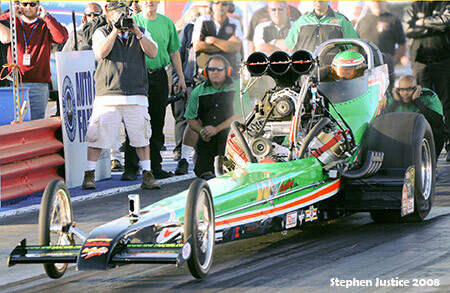 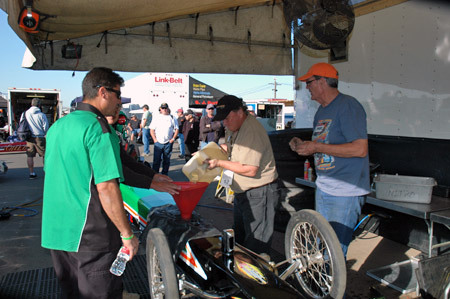 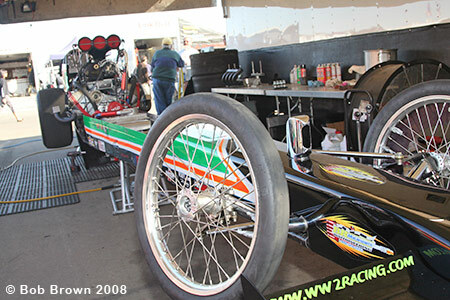 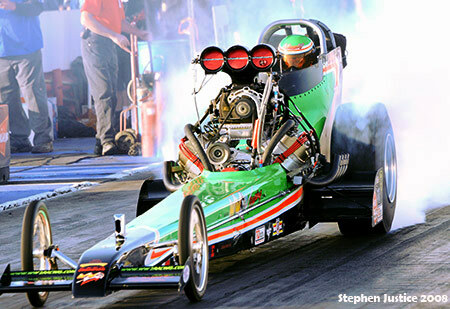 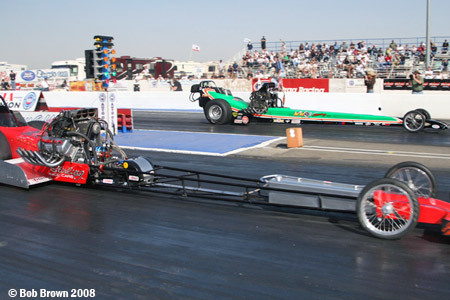 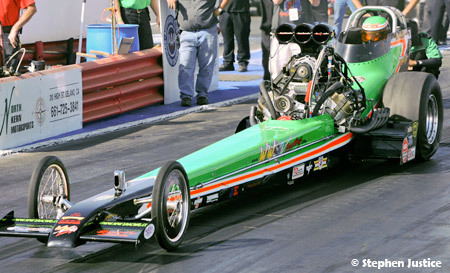 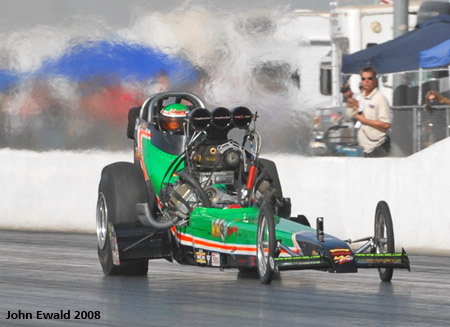 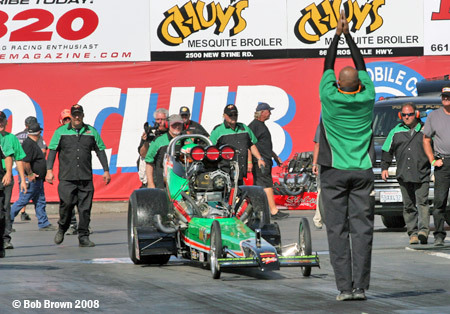 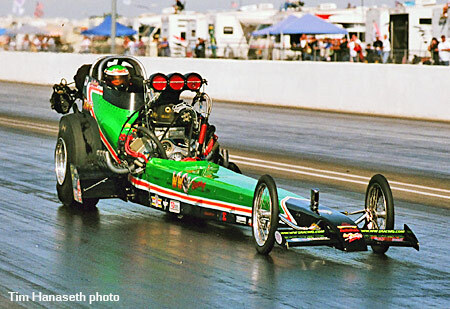 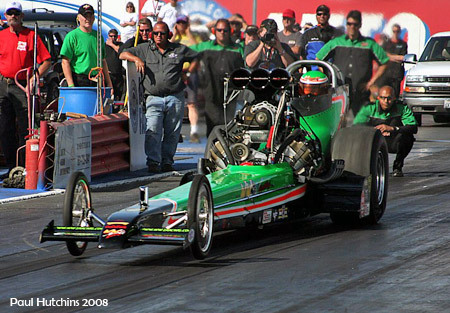 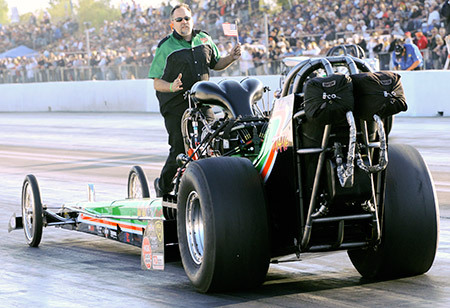 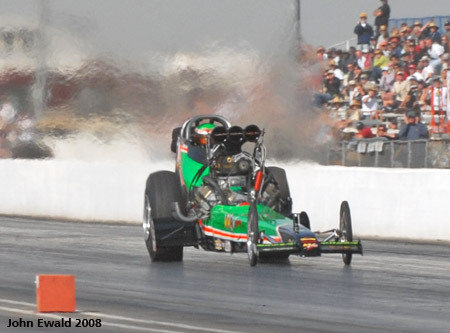 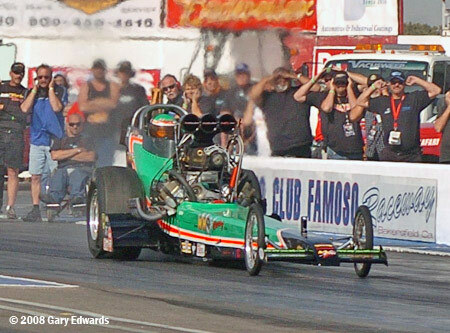 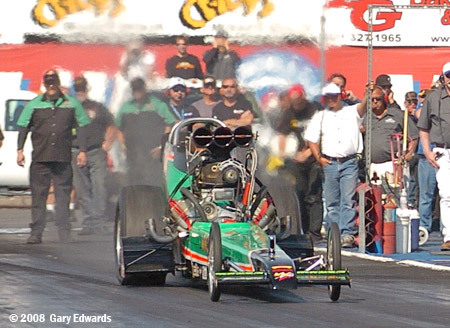 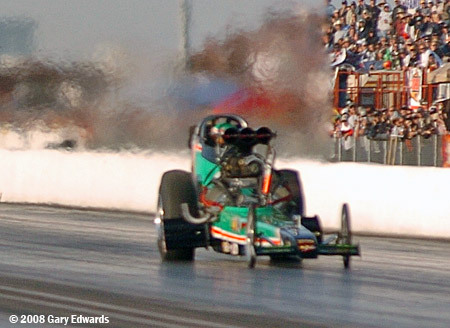 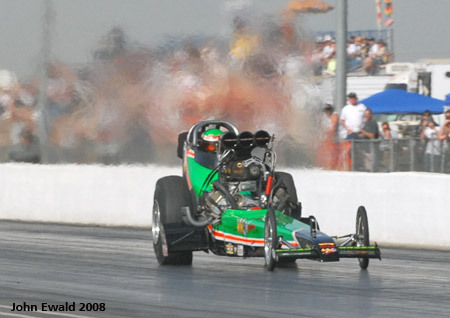 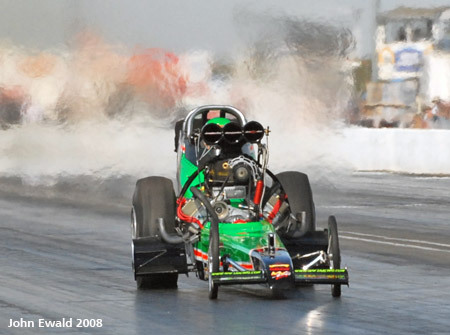 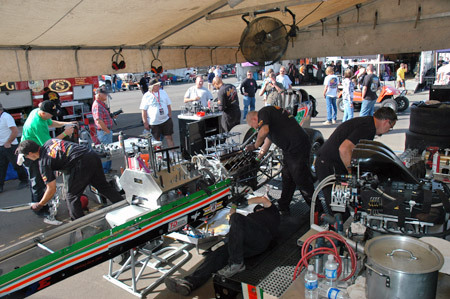 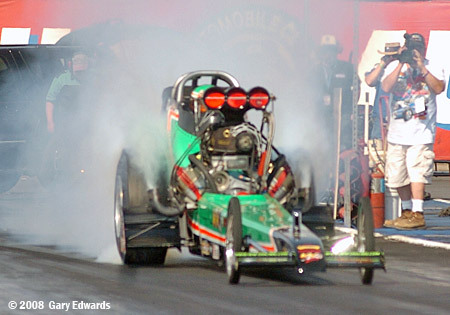 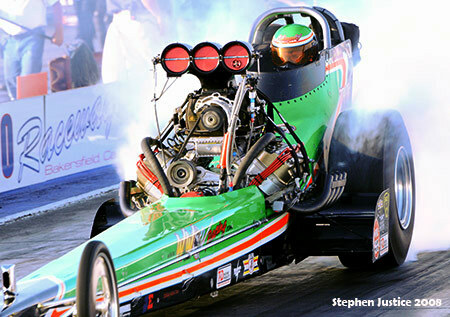 Coming off a three race win streak, Murphy entered the 17th California Hot Rod Reunion just 4 point behind Troy Green for the 2008 NHRA Hot Rod Heritage Racing Series Top Fuel Points Championship. 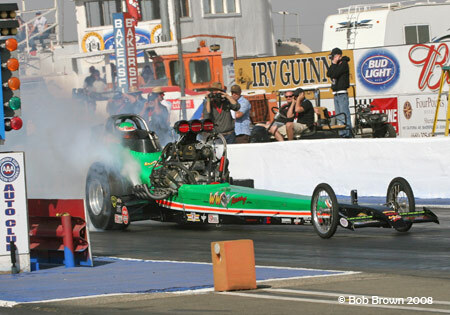 After the end of qualifying he was just 5 points back. 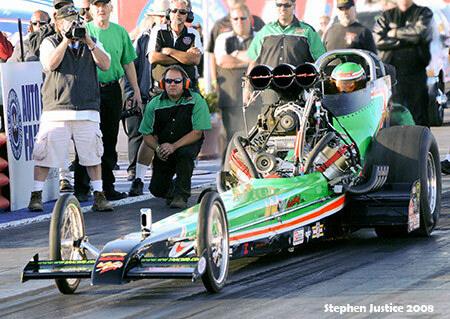 The task at hand was clear - he had to go one more round than Green in eliminations. 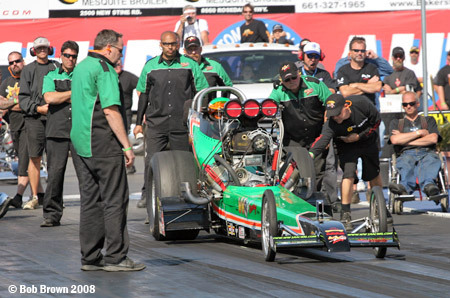 What made the scenario even more intense is the fact Green qualified #1 (5.72) and Murphy #3 (5.74) which put them on the same side of the ladder and if they both made it past the semis, they would meet in the final. 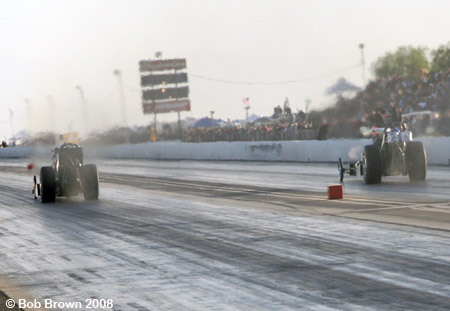 The drama heightened when both drivers won their first round match ups Saturday night. 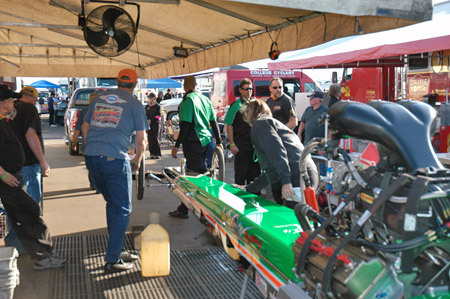 Sunday the tension was almost palpable. 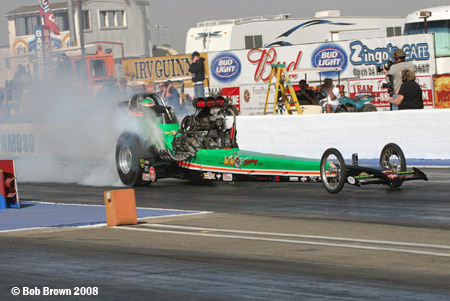 Again both Murphy and Green were victorious in round two and in the semi finals. 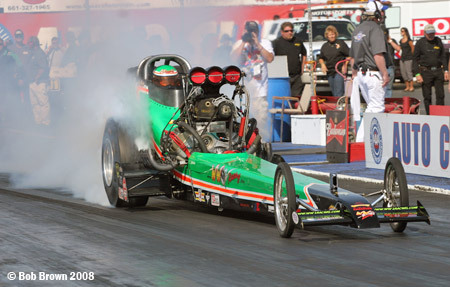 Murphy was out first paired with Brett Harris while Green would face Rick White. 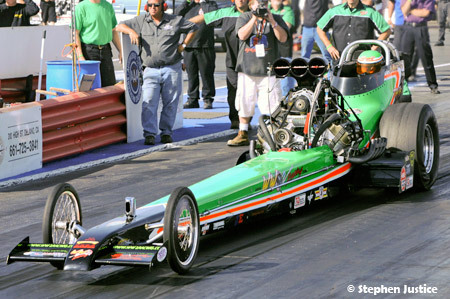 If Murphy won all the pressure would be on Green - if he lost it would be over. 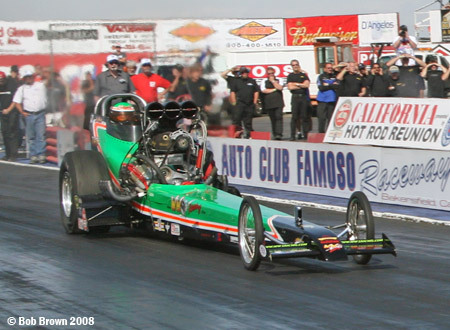 As fate would have it, Murphy spun the tires at the hit and slowed to a 5.81 while Harris unloaded low ET of the event (5.69) ending Jim's hopes for a 5th World Championship. 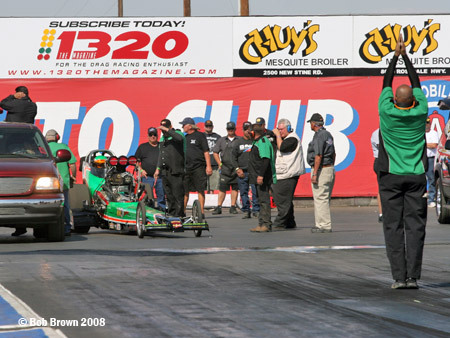 Photos and full results below. 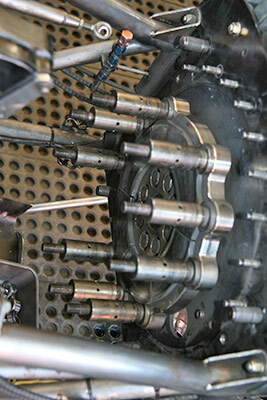 2:05 p.m. 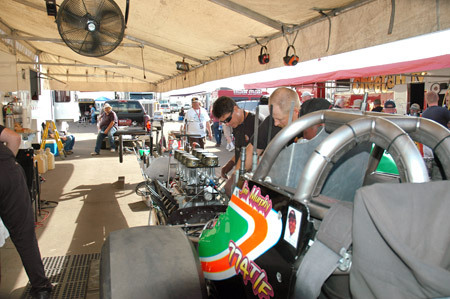 The first of only two qualifying sessions got under way. 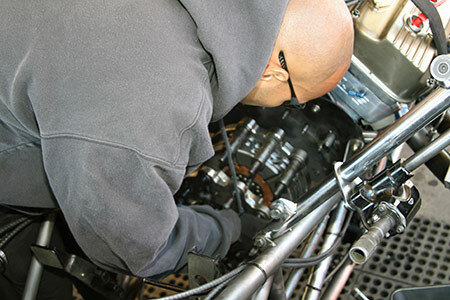 Weather conditions: air temperature 63 degrees, relative humidity 24 percent, barometer 29.91 inches, track temperature 88 degrees. 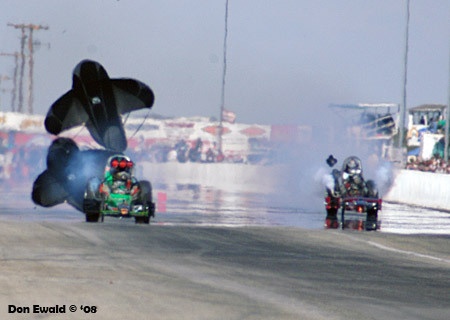 Perfect racing conditions. 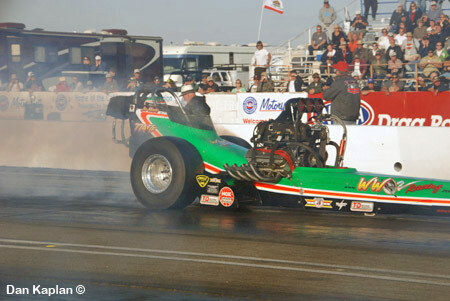 For his first shot at the Famoso quarter mile Murphy was paired with Pete Kaiser in the Qround Zero fueler. 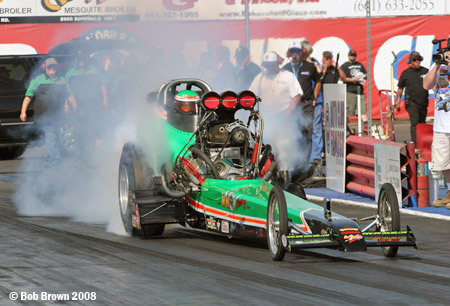 Dave Thornhill guided Murphy back from this burnout. 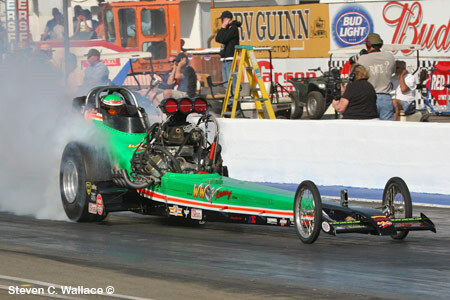 Murphy's ride left hard and carded good early numbers. 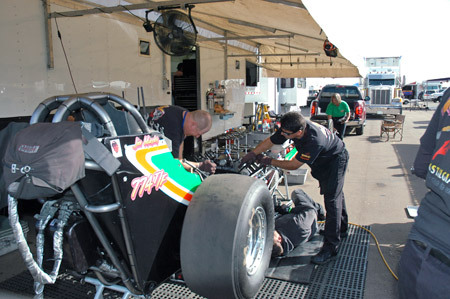 Murphy stopped the clocks with a nice 5.818 at 258.32 which put him in the #2 hole after session one. 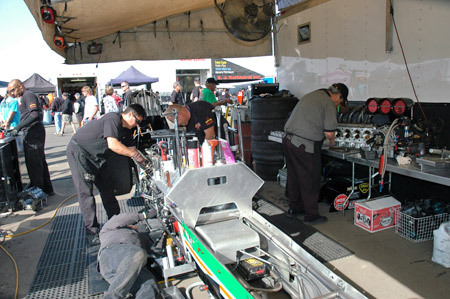 Following the 5.81 pass the car was stripped and serviced in preparation for session two on Saturday. 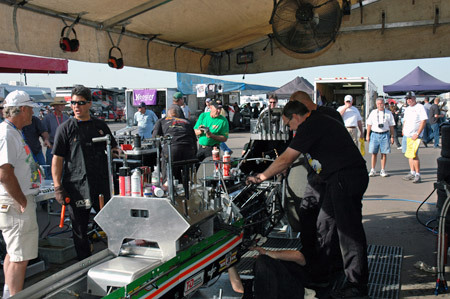 Crew Chief Tim Beebe went over the data collected from the run. 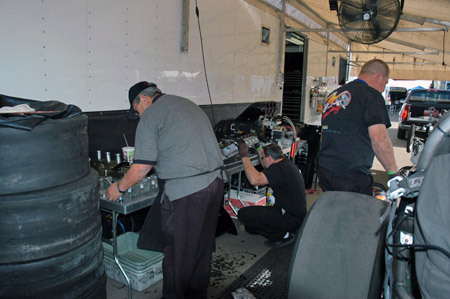 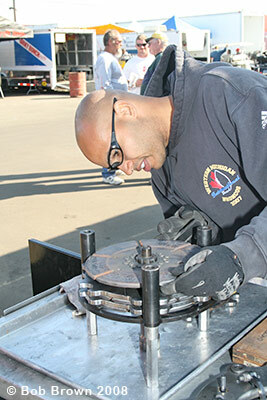 Michael Beebe is in charge of the clutch - arguably the most important component in the car. 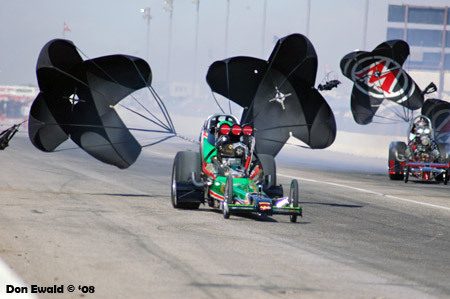 1:42 p.m. 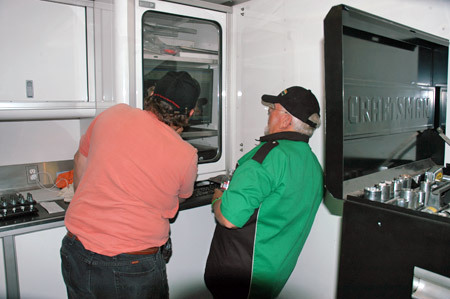 Unlike the March Meet which offers three shots to qualify, the CHRR offered only two. 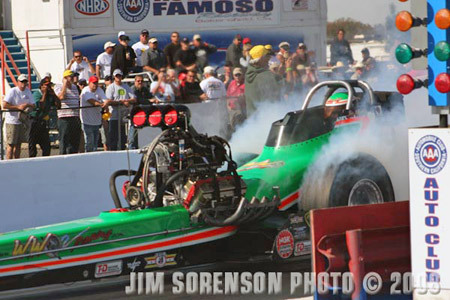 Michael Beebe lined Murphy up for his burnout. 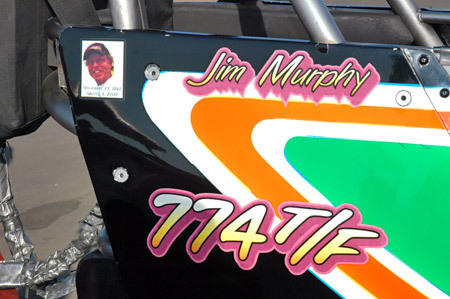 Jim was paired with Terry Cox. 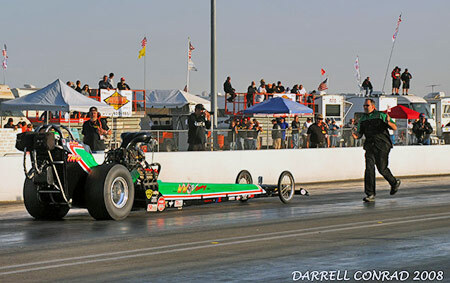 Once again Murphy reeled in a nice 1.03 60' time and just kept marching. 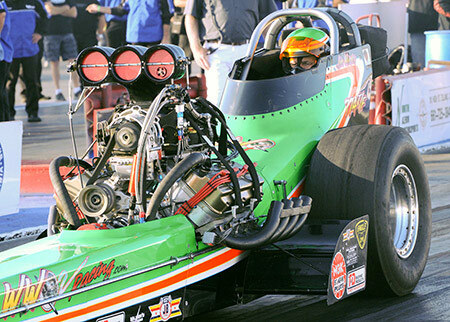 Straight, true and clean - Murphy went #1 with a 5.746 at 257.73. 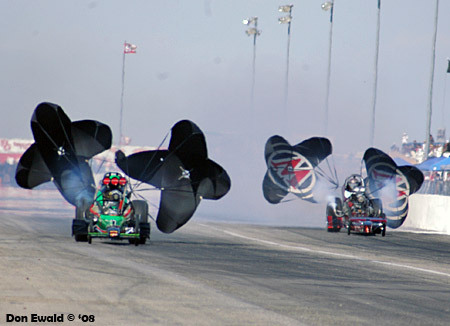 5:03 p.m. 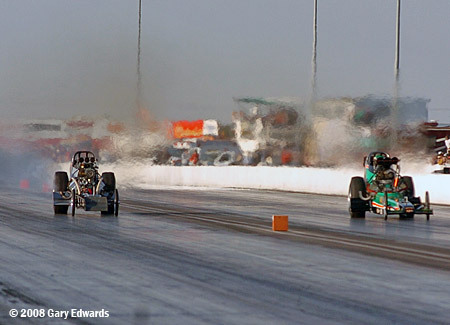 Weather conditions: air temperature 65 degrees, relative humidity 14 percent, barometer 29.90 inches, track temperature 84 degrees. 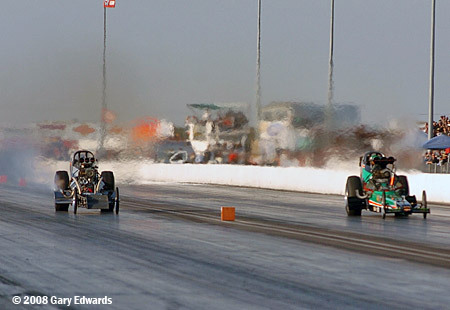 Another difference between the March Meet and CHRR is that the first round of eliminations is run Saturday evening prior to the Cacklefest program. 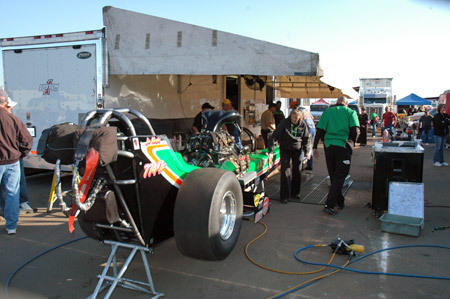 The car getting its final touches before heading to the staging lanes for round one. 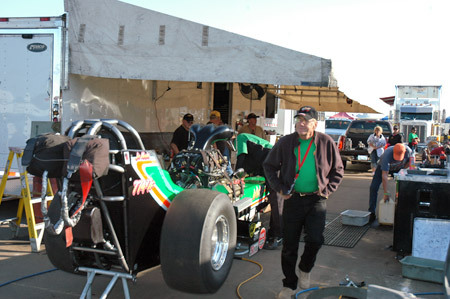 For the first round Murphy was paired with Jack Harris in the Paso Posse fueler. 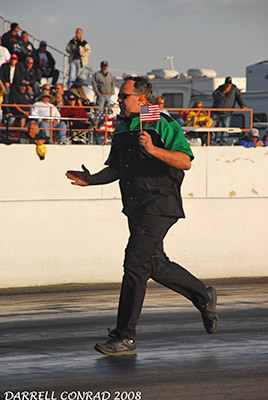 In an ongoing tribute to the late John Shoemaker, Dave Thornhill carries a small American flag during the backup process. 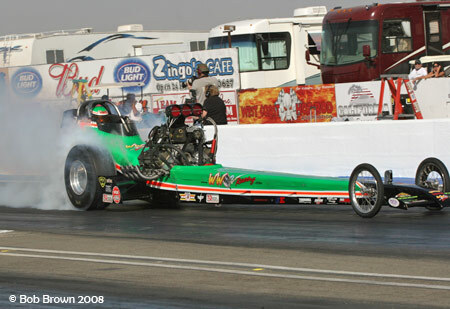 It is the same fag John's wife, Judee used to back him up. 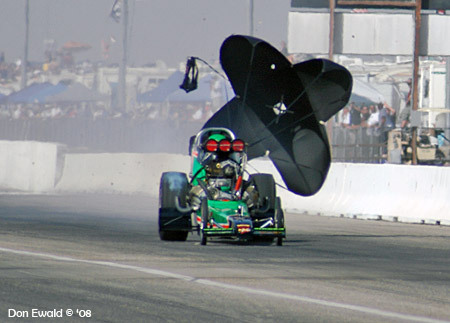 This race was over by the 60' clocks. 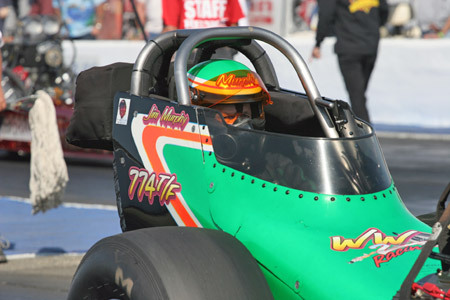 Harris moved first by a tad but could not hold off Murphy's incremental times: 60ft-1.049 sec., 330ft-2.650, 660ft-3.880/202.61mph, 1,000ft-4.911. 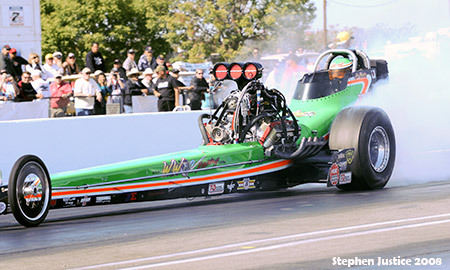 In the lights Murphy's 5.781 at 257.80 was more than enough to hold off Harris' game 5.912 at 219.24.